I'm trying, as one friend put it, to make peace with my sewing machine. I love the idea of being a competent seamstress, but my just-wing-it ways, which generally work out well for me in the kitchen, turn disastrous at the sewing machine. Now, I recognize you have to learn the rules before you can break them--I tell people all the time that I learned to cook simply by doing it, a lot, and following good recipes. From there I was able to branch out into experimentation. I'm hoping that with time the same will be true of sewing. I started small, with two inexpensive, pretty, and useful little babywearing projects that just required a bit of hemming (straight lines are still a challenge for me :-p). For material: two thrift store tablecloths, 100% cotton, and less than $5 a piece. The blue one is an older Target brand tablecloth (Target all-cotton tablecloths are known to work well for babywearing projects) about 95" long, and the whitish one an unmarked jacquard weave, about 104" long. I washed and dried them before beginning. Please note: Not all fabric is suitable for weight bearing applications. PLEASE read Jan Andrea's excellent Fabric FAQ if you are planning to make a wrap or ring sling. Since most wraps and slings are around 30" wide, and most tablecloths are around 60" wide, you get two wraps or slings out of a single tablecloth. After cutting lengthwise down the middle, just hem the raw edge. It's easiest to roll as you go. I used Gutermann all purpose thread. If you want to use the hemmed tablecloth as a shorty wrap, you're done at this point. If you want to make a ring sling, either sewn or no-sew, you'll need to purchase aluminum sling rings from slingrings.com. They ship fast in pairs, are very inexpensive, and have lots of pretty colors. I typically prefer large rings. Rings are also handy to have around for wrap finishes without knots. Rings from craft and hardware stores, especially those with visible welds, are not recommended. 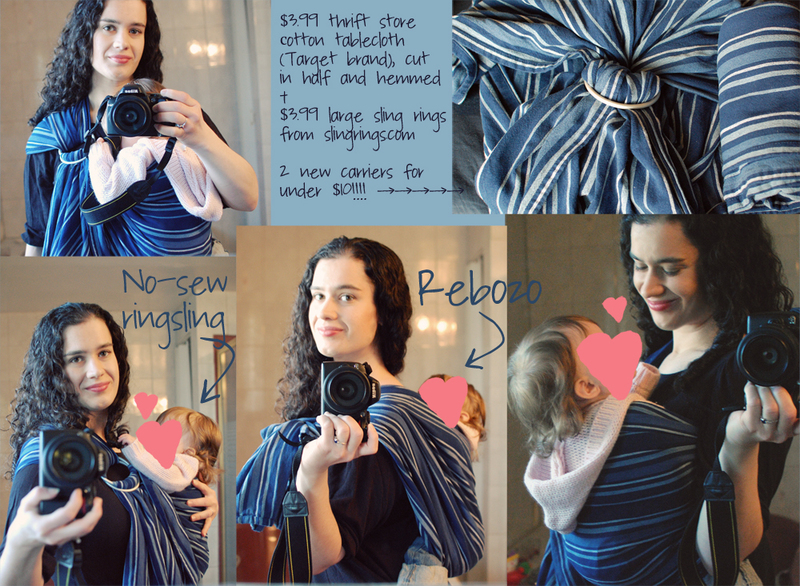 Babywearing International has compiled this list of videos for carries that can be done with a size 2 wrap (in our case, a tablecloth shorty), including how to thread a wrap through rings for a no-sew ring sling. For directions for sewing slings (and many other carriers), SleepingBaby.Net is the most trusted resource. I actually find the no-sew gathered shoulder quite comfy though. 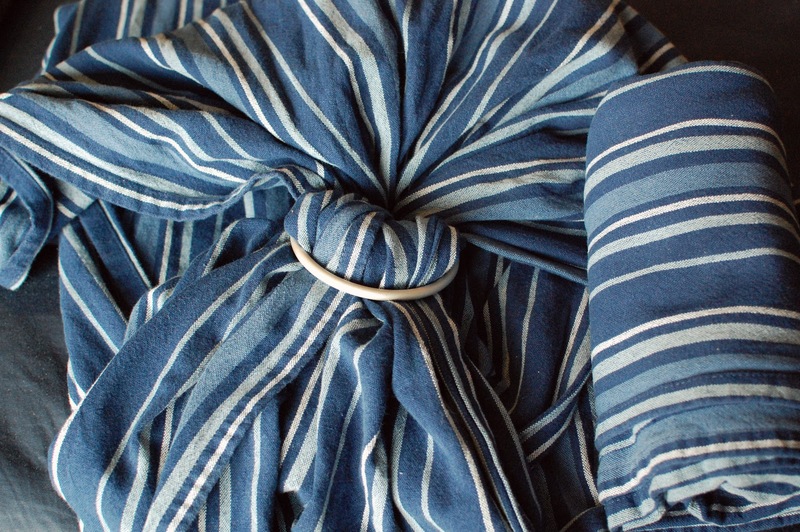 At 95", I can only use my blue striped tablecloth as a ring sling and rebozo. A bit longer, the white tablecloth gave me more carry options, so I had some fun ombre dyeing one half. Click the picture tutorial below to see it full size. I'm using a kangaroo front carry and a reinforced rear rebozo rucksack (RRRR or "Pirate") back carry in the tutorial images. 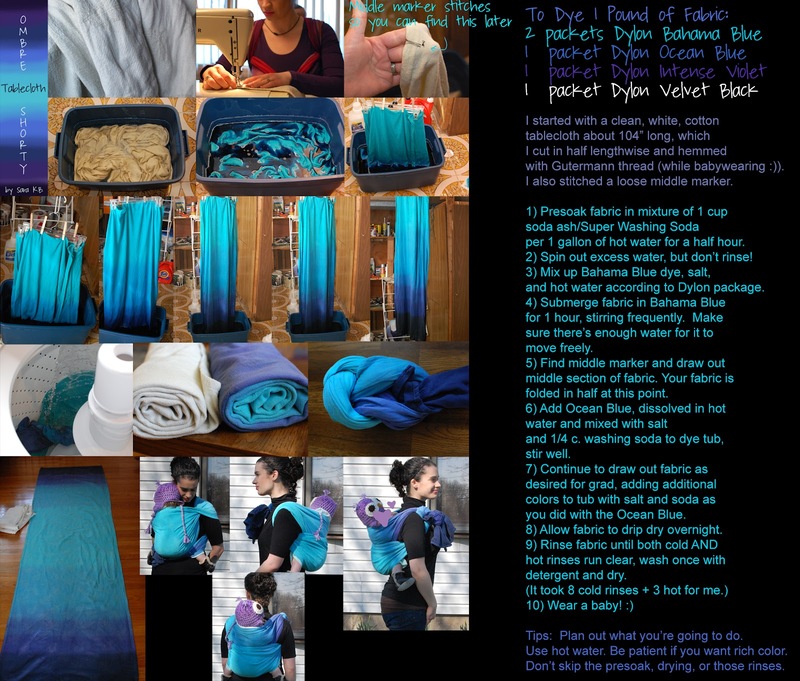 I used Dylon dyes from Joann Fabrics with great success, additional details are in the tutorial. Dyeing was a blast; first time I've been able to do anything artistic/crafty in quite a while, and it's so satisfying to make a beautiful, usable thing. I'm hoping to try making a tablecloth wrap-pod next, maybe when school is done for the summer. I'm also working at breaking in my newest woven wrap, a Storchenwiege Leo, a Mother's Day gift hubby let me have a little early. :) I've had an increasing number of questions about woven wraps in particular, so I'm planning another post soon with some info on choosing and using woven wraps that didn't fit in my Big Babywearing Post.